Neal Street Productions The trust women place in their midwife is a gift. The trust a midwife places in herself is an essential skill. As I teach and mentor student nurse midwives, I tell them, “Be the midwife in the room. Be their midwife. They are looking to you to help." 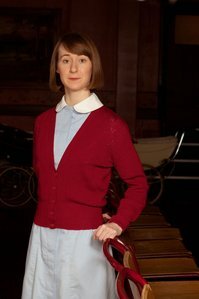 Cynthia, Trixie and all the midwives in Call the Midwife are wonderful at being the midwife in the room. They are calm and in charge even when scared inside. I think the phrase “Keep Calm and Carry On” must have originated with British midwives. Trust is an evolving and changing entity. It is built up with experience and knowledge. But it can be a fragile thing too. One bad outcome can shake it to its very core, as the character Cynthia discovers in this episode. You cannot be in the medical or childbirth fields without having something bad happen. Sometimes we find out the cause of a miscarriage or stillbirth. Sometimes we know of a problem for a baby or mother before and prepare the best we can. The hardest times of all are when something bad happens and you don’t know why. Every midwife will face a stillbirth or a neonatal death somewhere in their career. The heartbreak feels unbearable; the loss of all the future plans and what could have been. I have cried with families over such loss. It is hard every time I do it. It never gets easier, but I have learned to cope better and help the families better. Women and families want to know they will never have to feel that pain of loss again. “Tell me what to do to prevent every having this happen again,” they say to me. Sometimes I have an answer, many times I do not. These are the times that shake your trust in yourself. You question your actions. That can be very good. Business uses the term continuous process improvement. In medicine we call it a sentinel event. We should always try to do better. Look for ways to improve our practice. Sometimes that means interfering less — not inducing labor at 38 weeks because of back aches at the end of pregnancy. Sometimes it means watching closer — teaching women to check their blood pressure or watching for other changes. Sometimes improvement comes from examining a process to see if we have done everything we can to prevent complications. Self-examination is difficult but critical to how we care for women and families. This episode also made me realize that as a teacher I try to shield my nurse midwife students from these situations. But watching Cynthia struggle to cope with the death of a newborn made me realize how much a new midwife needs to have her teacher be there to help her through it. The term midwife means “with women.” I need to midwife the student through a bad outcome as much as the student or new midwife needs to learn how to midwife the mother through the loss. Especially for the times which don’t have any answers, just being with a woman and her family, holding her hand, sharing their grief, is part of building the trust in ourselves and the families for which we care. Henry Ford Department of Women’s Health Services has developed the Compassionate Care and Understanding During Loss (CCUDL) Support Group to provide help for those grieving the loss of a baby through infertility, miscarriage, stillbirth or newborn death. To learn more about it click here.